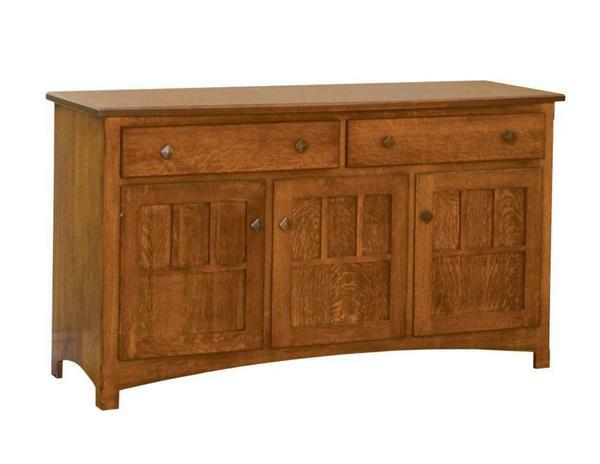 The Royal Mission Buffet with three doors is an exquisite demonstration of the Amish Mission style. The modest lines of the Mission style are sure to bring balance your home, while the stunning solid hardwood will provide a warm, inviting charm. This stunning 3-Door buffet is designed for functionality and owners convenience, but is sure to impress guests and visitors. Available in your choice of six beautiful hardwoods, you can customize the 3-door buffet to perfectly fit your home and style. We offer a wide variety of Amish tables and hardwood chairs to complement this beautiful Amish buffet. Please call one of our Amish furniture specialists today to get an order started or visit them at our store in Florida.